Stable Self or Haphazard Habits? I love this quote. It reminds me that you can create a clean slate any day. Every day is a new chance to practice becoming better. We are not tied to the chains of our past. We are who we decide to be today. Not feeling that same freedom of mind? Dig deeper by examining your assumptions with an article I posted previously. The article compares two perspectives on how to view our self. Which do you believe? Am I a stable personality? Am I a messy product of habits? Most people would say number one. Saying you’re “unstable” might raise some eyebrows. If we believe we’re stable, we might embrace our flaws and not improve much as an adult. Can you be kind to yourself, accept that you’re on a journey of improvement, and avoid hiding in a box of limitations from genetics, environment, and personality? This box is the fixed mindset from Mindset by Carol Dweck. If you want to discover which mindset you use most often, read these ten short statements and assess whether you’re more likely to say statements on the left or the right. 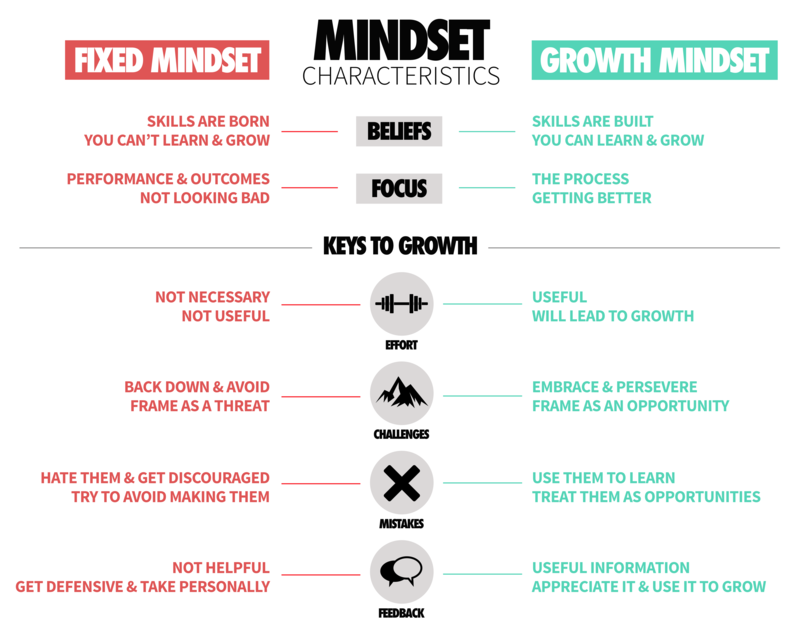 I prefer the growth mindset and use this model summary as a reminder of how to approach challenges, mistakes, and feedback. I’m not perfect. I make mistakes. I fail. Ask my wife about my basic social interaction habits (i.e. hermetic like a crab), but I’m not stuck. I have hope and a path forward. I believe we’re number two, a messy product of habits. Once I recognized that, it was easier to start cleaning up the mess. Some attributes like height won’t change, but many behaviors that we attribute to a fixed personality are malleable. When you hear yourself saying “I’m not creative” or “I’m not good at math” or for me “I’m not good at marketing”, you might find there’s more room for growth if you’re willing to practice. I love to practice. Gandhi reminds me I have a clean slate every day. Aurelius reminds me I have the opportunity to practice improving my behavior every day. He (of the interference, ingratitude, etc) and I were born to work together like a man’s two hands, feet, or eyelids. Aurelius, maybe the most powerful man in the history of the world, head of the Roman empire, and the old-dude from Gladiator, reminded himself to start every day preparing for the opportunity to practice rising above the inevitable conflict in his interactions with other people and so can we. Despite commanding legions of armies, ruling the Roman empire near its peak, and producing one of the greatest works of philosophy, I bet Aurelius would have struggled to convince Allen Iverson to adopt his views on practice based on this famous videotape from the former 76ers point guard. Maybe AI just needed a few more options for how to practice. Use these ideas to practice experimenting with the growth mindset today. Think about one default daily habit and replace it with a new behavior for a day or a week, just to remember how quickly you can change when you notice your habits and decide to act differently. Like Gandhi you can create a clean slate every day. Like Confucius you can clean up your messy habits. Like Dweck you can choose to grow. Like Aurelius you can choose to practice.